This dish has been one of my children's favourite! They can slurp up two bowls of chicken rice! 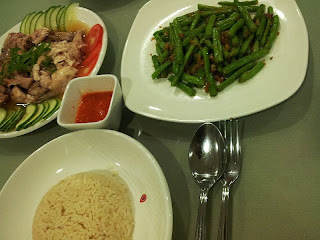 Basically, for this post, I will just teach you how to make the chicken rice as well as the chilli. As for the chicken, I only marinate with salt, sesame oil, ginger and steam it. Ater steaming, just ice bath it. So that one is quite simple. Blend the above ingredients and voila! You get your chilli to go with your chicken rice! For the quantity, please feel free to adjust according to your taste and liking. So after blending, you just adjust accordingly. Here's what I had for dinner! Enjoy!